British supermarket group Tesco is one of the world’s leading grocery and general merchandising retailers. The company is the UK’s largest retailer by both sales and domestic market share, with profits in excess of £2 billion. Tesco currently holds a 30% share of the UK grocery market, accounting for 14.3% of all retail sales in Britain, or £1 in every £7 spent in UK stores. Tesco specialises primarily in food and drink with its Value and Finest ranges, but has also become a major player in a range of non-food markets including consumer electricals, clothing, financial services, telecoms, fuel, internet services, music downloads and retailing and renting DVDs and CDs. Tesco Personal Finance is the banking arm of the Tesco plc. The business was previously run as a joint venture with the Royal Bank of Scotland, but in July 2008 Tesco paid £950 million to acquire the bank’s 50% share in the company. Financial products on offer include loans, credit cards, savings accounts, mortgages, and several types of insurance, including car, home, life, dental and travel cover. Tesco runs the world’s largest grocery home-shopping service, Tesco.com. The site was formally launched in 2000 – six years after Tesco first began operating on the internet. Consumer goods, telecommunications and financial services are also provided via the internet. Tesco Direct, the supermarket’s catalogue/internet service, was added to the retailer’s portfolio in 2007. Customers can browse the Tesco Direct catalogue or go online to purchase non-food goods ranging from home electricals, toys and furniture to sports equipment, jewellery and even bathroom suites. 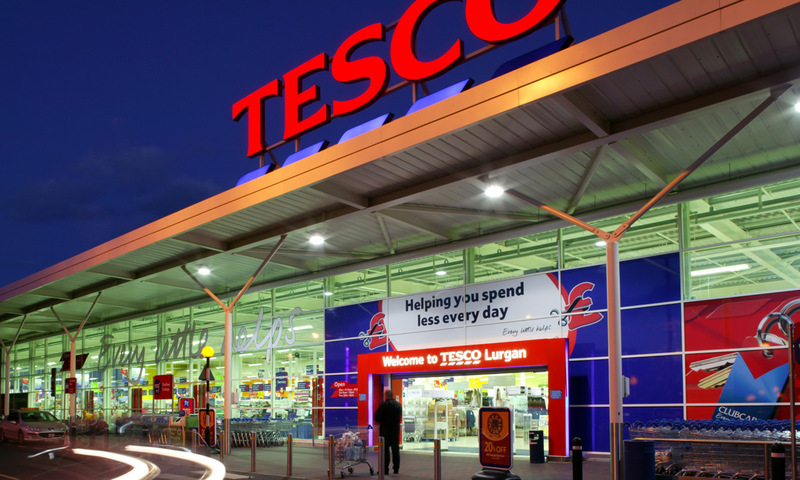 Tesco boasts a global store portfolio of over 1,800 stores. Besides the UK, the company operates stores in France, China, the United States, Poland, Republic of Ireland, Japan, Malaysia, Czech Republic, South Korea, Slovakia, Thailand and Turkey. In the UK, Tesco operates six different store formats, each distinguished by size and the range of products sold. Tesco Superstores – Tesco superstores are the company’s standard store format. These large supermarkets stock and sell all groceries along with a large range of non-food products. They also offer an in-store pharmacy. Tesco Extra – Tesco Extra stores are the retailer’s large out-of-town hypermarkets (second in size behind superstores) which stock nearly all of Tesco’s product ranges. Tesco Metro – Metro stores are medium-sized stores (sized between Tesco superstores and Tesco Express stores) that offer a range of food lines. Tesco Express – Express stores are convenience shops that are mainly located on Esso petrol station forecourts. Most of their stock consists of food, with an emphasis on higher-margin products alongside everyday essentials. Tesco Homeplus – Homeplus stores offer all of Tesco’s ranges, except food, in warehouse-style units based in retail parks. These large units feature an Order and Collect desk where customers can purchase and collect most items without delay. One Stop – One Stop stores are the very smallest Tesco stores. These stores work on a different pricing to all the other store formats and are also distinguished by their later opening hours. Tesco was founded in 1919 by Jack Cohen as a grocery stall in the east end of London . The Tesco brand first appeared in 1924, but it wasn’t until 1929 when the first Tesco store opened for business in Edgware, Middlesex. Fast forward 70 years and there are more than 2,100 outlets in the UK alone. Tesco Clubcard is a loyalty scheme run by the Tesco supermarket to thank their customers for shopping with them. You collect points for every pound you spend and redeem these against vouchers or reward schemes. You can collect points on most things you buy in-store (including groceries delivered to your door) or online at the Tesco website. You can also collect points when filling up your car at the Tesco petrol stations and on purchases from Tesco Direct. Spending on your Clubcard Credit Card also qualifies you for points. Once you’ve collected 150 points Tesco will convert them into a Clubcard vouchers and send them to you, together with other money saving products and services. You can spend your Clubcard vouchers in Tesco stores, Tesco online, Tesco petrol filling stations and at Tesco Direct. To redeem the vouchers simply present them at the checkout and the amount will be deducted from your shopping bill. Alternatively you may chose to spend them on Clubcard rewards which range from meals out to cinema tickets, hotels to holidays and many more deals. As well as money off shopping and reward deals the Tesco Clubcard also allows you to sign up for tailored mailings. These include baby and toddler club, Christmas saver club and emails which keep you updated with latest rewards and ways to earn extra points. Founded by Jack Cohen in 1919, Tesco started its humble beginnings as a grocery stall in East End of London. The first store opened in 1929 and since then has grown and diversified to now offer financial services, clothing, home furnishings and electronics. With over 2,400 Stores in the UK alone and 472,000 employees worldwide Tesco offers diversity of opportunities which is unlikely to be matched elsewhere. Whether you want to work at the Head Office or in the Store there are multitude of careers to suit your skills and career aspirations. Pharmacists to name but a few. If you’re looking for a graduate role then Tesco offer three Graduate Programmes. The Store Management Programme offers opportunities to work in the stores directly with the customers. On the other hand the Office Programme allows you the opportunity to work in the office with a choice of business areas to include Finance, Marketing, Property and Engineering. The Distribution Management Programme allows you to work at the forefront of logistics management. Tesco aims to reflect the community it serves by mirroring the workforce it recruits. They try to ensure that their employees are able to work in a way that suites their circumstances. They support this by offering flexible working hours, part time roles, job sharing and shift swapping. All employees are encouraged to broaden their experience so that Tesco’s Every Little Helps commitment is evident in everything they do. They offer development training, apprenticeships and qualifications at work. Are you a Tesco person? To find out more about Tesco jobs and to see current vacancies visit Tesco Careers.